Interpreting the Civil War: Fire on the Mountain: A Forest Fire Ignored? Fire on the Mountain: A Forest Fire Ignored? All that's left from an entirely different fire. There was a massive forest fire on the South Mountain at the edge of Adams County. It ripped through thousands of acres of woodland along the crest of the ridge. The undergrowth went up like a match. The spring up to this point had been unusually dry. And a fire started. A fire didn't just start itself. It was started behind David Goodyear's tavern and inn near the Adams County line. "Some rascal," congressman Thaddeus Stevens later wrote, started the fire which began scorching the mountainside. The extent of the damage is unclear. The fire went, apparently, largely unnoticed in the local press. The South Mountains loom large on the horizon of Gettysburg, but no one took notice in the pages of the Compiler or Sentinel of a massive conflagration on the side of the peaks in mid-May 1863. Other things were on their minds. But for Thaddeus Stevens, a fire on that particular mountainside meant trouble. "I came up here yesterday," the congressman wrote his nephew Alanson Stevens, who was fighting with Independent Battery B, Pennsylvania Light Artillery out in the western wilds of Tennessee, "to see what a grand sight is a mountain all on fire." All told, Stevens alerted his nephew and ward, "it burnt more than 5000 acres of the furnace Land." In his May 22nd letter, Stevens explained that fire stretched from the mountain gap which sheltered Stevens' Caledonia Iron Works northward to Pine Grove and west, "nearly to Shippensburg." In Gettysburg, the newspapers fixated on an invading army barreling northward just as it had the autumn before. Would they breech Pennsylvania? Was the Commonwealth safe? Fire held no candle to the threat of a marauding rebel army. And yet fire raged in the woods atop the South Mountain range. "The loss to the young timber is very great," Stevens wrote his nephew. The forge it self, with its furnaces for refining iron blooms and iron bars, was intact. And business was good. "I am glad you remain well," Stevens wrote his nephew, "I think when you come home you will have to take the management of the works." If it weren't for a shortage of iron ore, a fortune was waiting to be made in the melting of the raw metals into something useful for man's desires. Alanson knew well that iron was in demand. That past winter, his battery had thrown round after round of deadly ferrous missile sailing into the enemy ranks. And after the Battle of Stones River, Battery B sat at Murfreesboro, guarding middle Tennessee from recapture by the grey armies. Delivering iron was Alanson's trade, just like it was his uncle's. "There is no knowing when this war will end," Stevens wrote to his nephew from the smouldering mountain surrounding his industrious iron works and dozens of employees' homes, "I am getting too old to enjoy it." War was stretching into another summer campaign season. Two weeks later, safe in Lancaster, Stevens again wrote to his nephew that, "We are still unlucky in this war - which ought to have been ended by this time." That war, now dragging into its third bloody summer could be solved. "The slaves," Stevens astutely noted, "ought to be incited to insurrection and give the rebels a taste of real civil war." Stevens didn't know it yet, no one in Southern Pennsylvania knew it quite yet, but they'd all be getting a taste of that war very soon. And fire would once again burn on that mountainside in Caledonia. I am indebted to Beverly Palmer and Holly Ochoa's heavy lifting in compiling The Selected Papers of Thaddeus Stevens - Volume I: January 1814-March 1865 (Pittsburgh: Univ. of Pittsburgh Press, 1997). They've put a good chunk of Stevens' writings and correspondence into one handy place. Stevens' 22 May 1863 letter to his nephew Alanson appears on p. 396. Fire would burn on that mountainside on June 26th 1863 under the order of Gen Jubal Early, CSA. 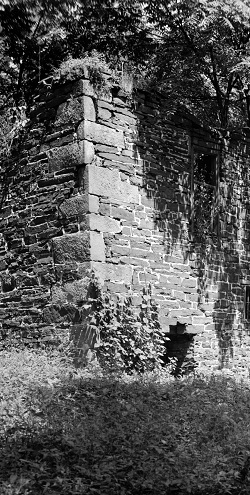 The 17th Virginia Calvary burned all of the Caledonia Iron Works' buildings and looted the company store. Early destroyed the works, although Lee gave orders that no Union property was to be destroyed, because he knew that the works were owned by Thaddeus Stevens who was an ardent Union War Hawk that wanted the complete defeat of the Confederacy. Hearing His Voice: What Does "War" Have to Say? A blog talking about how we talk about a war where over 600,000 died, 4 million were freed and a nation forever changed. Meditating on interpretation, both theory and practice, at no charge to you. The opinions expressed here are the views of the writers and do not necessarily reflect the views and opinions of their respective employers.